Enthraling sock weekend update coming soon. Lots of family time this weekend, so I’m declaring it a sock weekend. We’ll see what I get done by Sunday! Also, the big question is, what knitting team do I join for the Knitting Olympics? I have noticed some bloggers who have more than one team, but I feel like I should just pick one….. So this one goes right up there with my Anouk in the “idiotic knitting mistakes” category. But this time I can’t even blame a long car ride and misread instructions; it’s one of those moments when you feel just plain dumb. 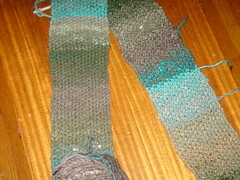 I started this scarf in Noro Silk Garden last Thanksgiving for an easy “knit and socialize” project. It was great until I realized that I had not nearly enough yarn to finish it. So I tossed it in the closet and just decided to keep my eye out for a skein. But one wasn’t turning up, and I had forgotten about it unitl a couple of weeks ago when I came across the same colorway. The blues were a little different, but the whole thing was close enough that I grabbed it, threw it in with the scarf and made it my lunchtime project. Perfect, right? This is not Silk Garden. It’s Kuyeron. I actually went straight from silk/mohair/wool to 100% wool and didn’t notice for about 8 inches. The colorway is close, but the texture is not nearly the same, so how is it even possible to knit that much and not have a clue?? I could chalk it up the to cruel 25 minute lunch breaks we teachers have to try to eat, pee and maybe relax a litle bit, but I still knit quite a bit this afternoon before it dawned on me. So I’ll blame this one on “post holiday/end of the semester/working mama stress” and leave it at that. Finally, I’ve got something to show for my early tries with the spinning wheel. These are actually two separate batches. 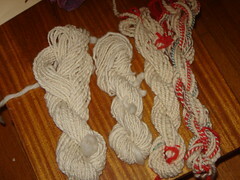 The two skeins on the right I made at Woolstock (hosted by Susan’s Fiber Shop) last summer. I took a beginning spinning class (of which I was the only person!) and after about 3 hours of spinning walked away with some pretty decent yarn for a first try. The two on the left are from my own wheel that I picked up in August. The wool is punta top. The one on the far left is double-ply, and the next one in is a single. This yarn is not very well balanced and quite curly, but for my first try on my own I’m happy with it. The big question is what to do with it? I’m going to knit up a big swatch with it to see what it turns out like, but where to go from there I have no idea, other than to just hang it in my yarn closet to look at. Crooked potholders anyone? After a few months of collecting dust in the corner, I finally got my spinning wheel back out today and actually got about an hour of spinning in. I had gotten an Ashford Traveler last August and had a good start at it, but my problem was the Little Man can not keep his hands away from it. So everytime I thought I had a bit of time to spin it was all messed up, which left me frustrated and too crabby to spin. I still haven’t found a good place to put it that he’ll leave it alone, but the good thing is that it’s old news now so he doesn’t play with it quite as much. I managed to ply up some singles of the punta top I had been working on last fall. It is drying in the basement as I speak (LM was very helpful in the washing of it!) I’ll post pictures once it’s dry. I think we’ll get an early bedtime tonigth since LM refused a nap again, so I’m hoping for a good three hours on the color by color scarf tonight. As for the blog, I need to get some help with this thing. I can’t seem to find the help I need on Blogger’s help page. I’m trying to find out how to use a button as a link rather than a text. 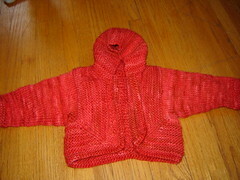 I got the Knitting Olympics link up on the side, but have no idea how to make the actual button the link. I’d also love to get my own button. Any ideas? As far as my socks go, as you can see they are done!!! I’m starting to think that one should not photograph ones own feet (what an unflattering angle, never mind the unshaven legs) but I’ll let vanity go for the night so you can see the stitch pattern. 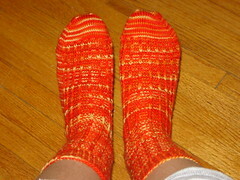 These are the Classy Slip-Ups from Betsy Lee McCarthy’s book, “Knit Socks.” The yarn is from Knitpicks in marigold. The socks feel wonderful, but I have to say I’m not crazy about the color, especially combined with this stitch pattern. I’m not a yellow/red kind of girl and have no idea why I ordered it. I started the socks last summer for an easy travel project and wasn’t happy from the start, but I kept running into times that I needed some knitting and these were the only travel-friendly items on the needles, so here they are. I still have half a skein left, which will go to another pair for LM. I have to say, he is still my biggest knitting fan and was very impressed with mama’s skills!